Mumbai: Guru Nanak Dev, founder of Sikhism and the first of the ten Sikh Gurus, through his teachings has always promoted the idea that love and concern for nature is part of a holistic approach to life and thus environment degradation or exploitation must be avoided. To honour his vision on his 550th birth anniversary, the Punjab government will enhance state’s green cover by planting 550 saplings in all its 12,700 villages starting September 30. The massive plantation drive will be carried out under its initiative ‘Tandrust (healthy) Punjab’, that attempts to make state healthy and clean by fighting against issues like air pollution and waste management. On the auspicious occasion of 550th Prakash Utsav of Sri Guru Nanak Dev Ji, my govt has decided to plant 550 trees in every village by Sept 30, 2019 under the mission #TandrustPunjab. All the key departments will directly oversee its arrangements & implementation. Institutions and organisations like youth clubs, schools, NGOs, religious groups have been given special invitation to join the gigantic drive. Also Read: Swachh Report Card: Can Punjab Become ODF By October? State departments of Forests and Rural Development and Panchayats have been roped in to make the task smooth. Nearly 66 lakh saplings will be given to the departments who will then distribute it among the village heads. People can procure the saplings for free from Village Panchayats. This isn’t the first time that the state government has shown its commitment towards providing clean air to its residents. On World Environment Day, the Chief Minister had launched Ghar Ghar Haryali’ app for providing information about saplings available with the Forest Department as per season along with a booklet on ‘Tandrast Punjab’. 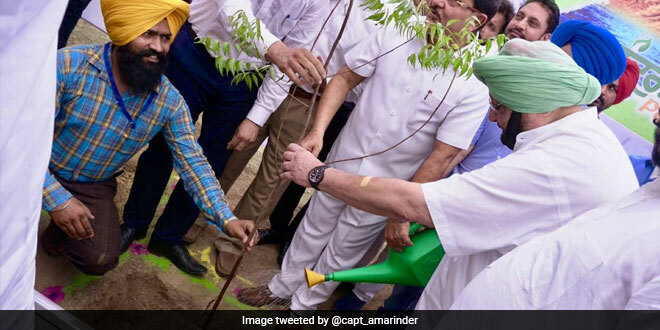 The Chief Minister also formally launched the district administration’s ‘Mission Green Mohali’ initiative to plant one crore trees in three years. He announced that the forest department would provide one lakh saplings of sandalwood to farmers for planting at the boundaries of their fields. He said that department had set a target to plant eight crore saplings of various kinds across the state.